I love this app! Great tool for anyone doing it yourself or keeping up with your money manager! Warning. Check your email confirmation if you order this because that’s the only place you can cancel and avoid the automatic monthly renewal - tick tick. There’s virtually no user account management functions, many of the links are either broken or just trying to get you to upgrade. (Note to Mr. Gunderson: this strategy would probably be successful if you threw the $10 a month curios investors a bone, but this crappy stale and hard to navigate app says nothing for what we’d get if we signed up for $89 a month). The presentation media is from 2013 and it’s a bit heartbreaking as I listen to Bill religiously every morning and for such a serious guy who’s supposed to be detail oriented, this app is a literally a joke and looks like it was created by a 5-year old. Best App of it’s kind. Invaluable! With over 20,000+ entities in the Market, this App has sifted through most of the trash to give you a more streamlined assortment of performers to choose from. I have used this App since it was available for the iPad (& now have it on both iPad & iPhone). When it 1st became available late 2011early 2012, I was a bit overwhelmed about the data, thought naively that picking only from the A+ rated stocks/bonds/mutual funds guaranteed success...it did not. That is not it’s function. This is a tool, not the Goose laying Golden Eggs! 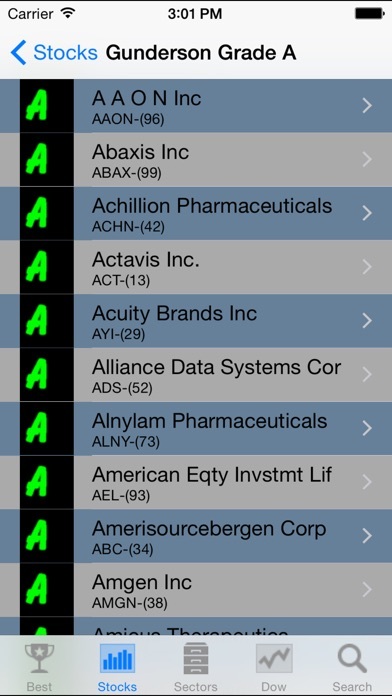 Use this App to choose top performers, look at their technicals (charts & indicators). Then based on that combined info, decide which& what to invest in(trade). Gunderson has done most of the research on the entities included in the App. The grades/numbers may change daily since the data is updated DAILY after the Market closes. This is a good thing! No other App does this! 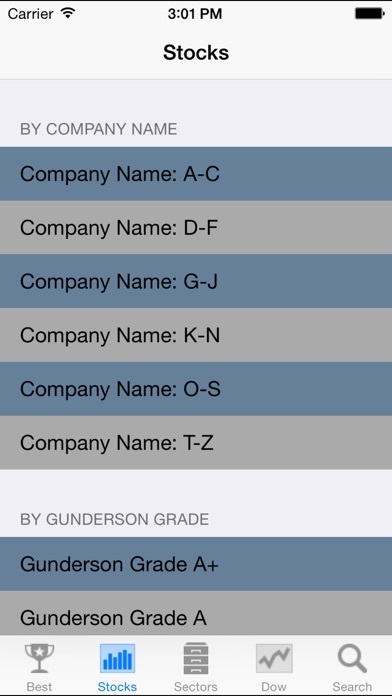 If a stock etc is not included in the App, don’t fret, send Gunderson an email naming the entity you’re interested in, he will look into it & add it to the App if it is a worthwhile stock/fund/bond/etc. I’ve learned that choosing stocks from the A+ to B+ overall rating range with charts trending upwards have consistently helped my returns stay in the double-triple digits. Since I am a long term investor, I usually don’t sell unless the overall grades tankto the D range with downward trending charts. This has also kept my losses down to a minimum. 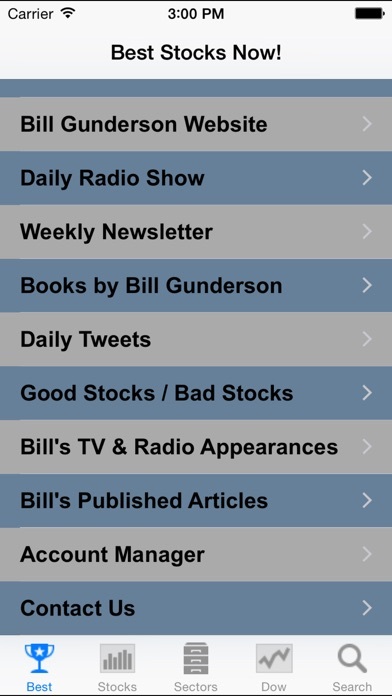 Gunderson’s App has been the most reliable of it’s kind. Zacks & Motley’s Fool is not even in the same league.....judge for yourself. 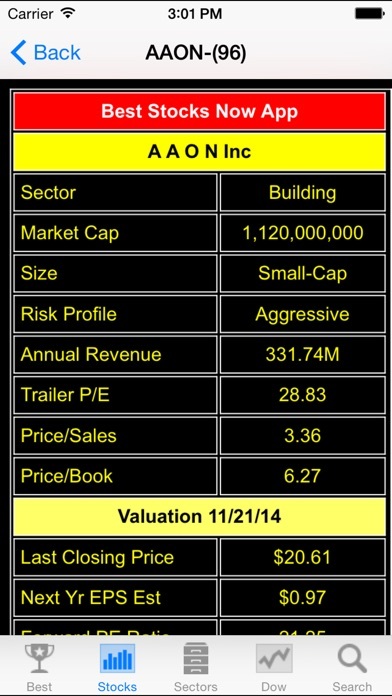 If you’re a serious investor/trader you will easily see the time saved researching stocks etc., using this App. If you are only looking for another “Get rich Quick” scheme, you will be disappointed, this App is not for you.... neither is trading in the Market! This app is free first of all, and you can make tons of money from just the free “non subscriber”. Bill is extremely knowledgeable about the market and his giving a lot of this away for free. He also has a podcast. It’s free also. Updating the app takes you backwards. Most of the subscription options listed within the in-app purchase section are actually not available. I have been informed by support that updating the app removed all of the yearly subscription options and that there are no plans to offer them again. A downgrade disguised as an update - thanks. Bad enough the app carries the appearance of something created in a grade school computer science class. And still no iPad version. How many apps like this still stick us with using an iPhone version on 2x. I can name one ...this one. I'm out. App is an afterthought, a throw-in revenue source for Gunderson. There are better options from folks that actually listen to their customers. It says "one month premium - only 89.99." I think it should be "one year*," am I wrong? Terrible app. Don't waste your memory. Info is unsupported. This is just a lure to get you to pay for another service or app.